Provided combined storm attenuation and rainwater harvesting. RRP £3035+VAT, including hydraulic calculations. 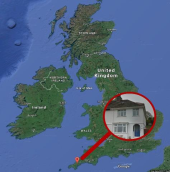 The Rain Activ system was installed in a 4 person family home in Truro, Cornwall. Rainfall from a roof area of approximately 110m² is routed into a 5000L shallow dig harvesting tank. Around 3000L of the tank’s capacity is used for rainwater harvesting, with the remaining 2000L used to attenuate flows at a controlled rate during intense storm events. The tank was fitted with a tank level monitor and a data logger to collect data during storm events. Reduce storm water discharge rates to new industry lows of 0. 3l/s whilst simultaneously providing full domestic rainwater harvesting for the families toilets, washing machine and garden tap. Monitor the tank level data to provide an accurate representation of domestic rainwater harvesting consumption as well as stormwater discharge rate. The rainwater harvesting capacity was calculated to BS8515, 3000L of storage was specified-providing enough volume for around 600 free toilet flushes between each rainfall! A WRAS approved management system was installed to provide backup during dry periods. 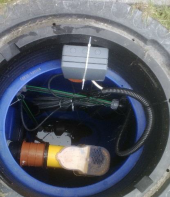 Stormwater is discharged though a 10mm orifice to control the flowrate into the drainage network. 2000L of capacity is available for attenuation. During the critical 1:100 year storm event with a 40% climate change allowence, the inflow is predicted to be 3.1l/s with under 0.3 l/s discharged. Even our team have been amazed at the extent rainwater harvesting has reduced the strain on the drainage network. In 12 months, the system discharged just 4 times into the drainage network. 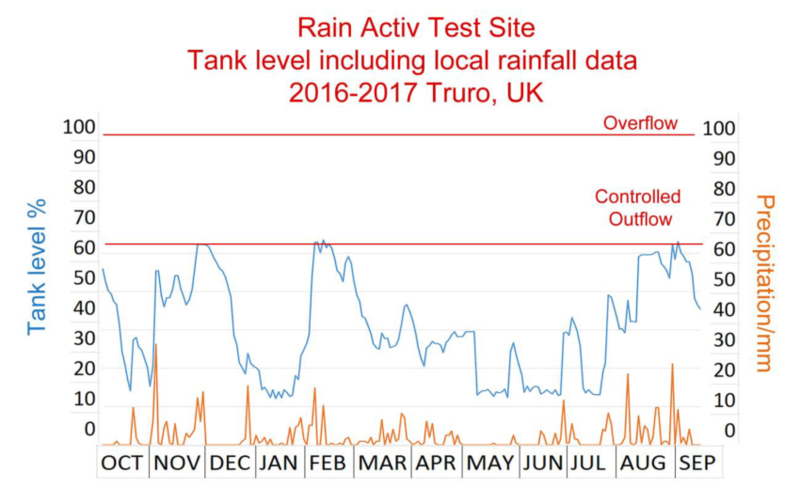 Even when it did discharge during the heaviest storm events, the rate was heavily controlled at under 0.3l/s This clearly shows the tremendous effect of rainwater harvesting as a method of attenuation. As the tank’s capacity is in constant use, storms simply fill the tank’s capacity rather than entering the drainage system. We estimate the client will save around 60,000 litres of mains water per year, equating to around £350. Maintenance schedule (one visual check/clean per year) has been kept to. The water quality is high; clear, clean and odorless with the filter clearly displaying it’s self-cleaning properties. Hydraulic calculations provided (Micro Drainage) normally an additional cost, the remit of a consulting civil engineer (Approx. £750-1000). System arrived on site pre calibrated and fully assembled, reducing installation costs. Addition of rainwater harvesting increases value of home, providing client with a year on year payback, and making the development more sustainable. Our team have analysed the data displaying the Rain Activ’s drainage curve. This has proven itself to be virtually identical to that of both the theoretical and lab data. 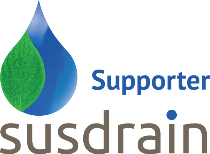 We are delighted to demonstrate how Rain Activ can provide industry leading, low discharge rates combined with full domestic rainwater harvesting.